Make the batter by mixing all the ingredients together (except the egg whites), leave to rest for 1 hour. Meanwhile, sweat the onions and the celery, cook for 10 minutes. Then, add the pealed and diced tomatoes, olives, capers, sugar and vinegar. Leave to simmer on a low heat for approximately 15 minutes. Rinse the aubergines, fry, then add to the caponata. Whisk the egg whites until stiff and blend in with the batter. 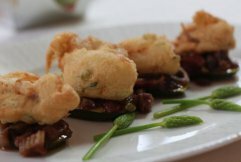 Fry the previously battered cubes of monkfish and serve with the caponata.